The Rhode Island (BB-17) was the fifth and last of the Virginia-class battleships authorized by Congress in 1899-1900. Built by Fore River Shipbuilding Co., Quincy, Massachusetts, the Rhode Island was laid down in May 1902 and launched in May 1904. Commissioned on 19 February 1906, the ship when fully loaded had a displacement of 16,094 tons and was manned by 40 officers and 772 enlisted men. 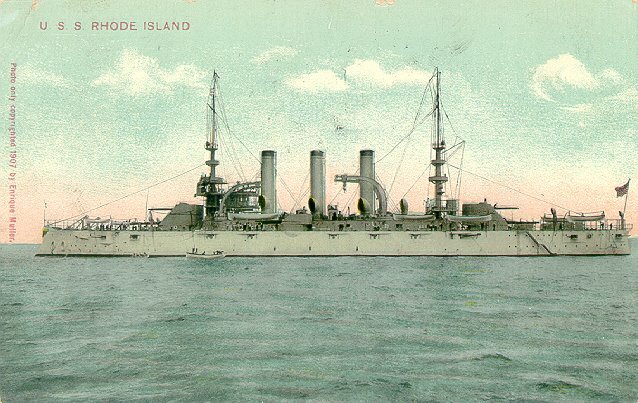 The Rhode Island served in the Atlantic Fleet in 1907, the Great White Fleet from 1907 to 1909, and the Atlantic Fleet again from 1909 to 1915, when the ship was placed in reserve. Returned to a full commission in March 1917, the Rhode Island served as a gunnery practice ship and a troop transport during World War I and then moved to the Pacific Fleet in July 1919. The Rhode Island was decommissioned and placed in reserve again in June 1920 and scrapped in November 1923.